Why yes, with these educational kids’ TV shows they can! What are your kids watching on TV? While we are all about limiting screen time in our kiddos, there are times when a TV show or two has its benefits (Sunday morning lie-in hello!). We’ve found some great educational kids’ TV shows available here in Singapore that are fun to watch and have an educational element thrown in, too. Daniel Tiger’s Neighborhood is produced by The Fred Rogers Company and is a very sweet programme that teaches young kids about emotions. Educational elements: Through stories based around Daniel Tiger, the series gently explores situations young kids may have found themselves in – feeling jealous or scared and together they explore their emotions and ways to deal with them positively. Catchy songs highlight each episode’s core message, making it easy for kids (and parents) to remember. The Stinky & Dirty Show is every vehicle-loving kids’ dream show. 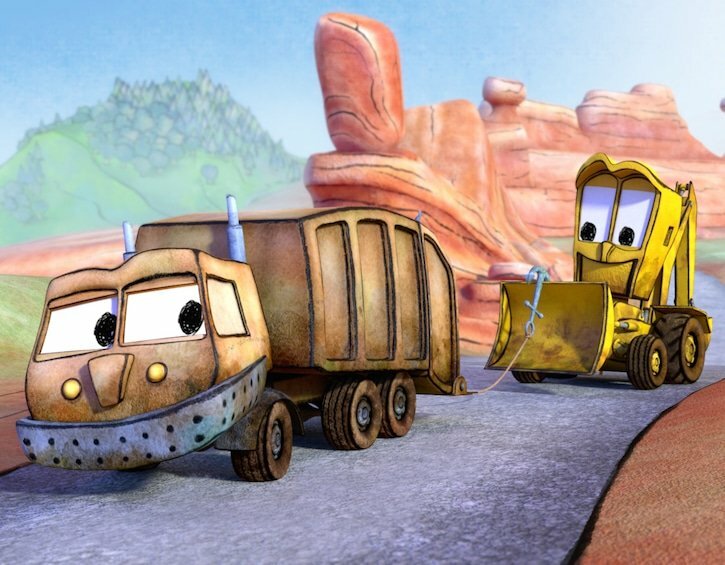 The series sees two best buddies, a garbage truck and a backhoe, solve problems together in a light-hearted way. Educational elements: The characters’ can-do attitude is a great example for perseverance and confidence, plus there is lots of info for kids on problem-solving and working together as a team. Age: 4yrs+ (but the educational element will appeal to older kids, too – hence it’s great for siblings of different ages). Storybots mixes animation, video and songs to make a charming show which follows a group of “storybots” who need to find the answer to a “big question” asked by a kid (“Where does night come from?” or “How do airplanes fly?”, for example). The storybots take you on an adventure to find the answer, which is explained a few different times to help younger kids. It’s a great show to watch if you have two kids one younger (who will be engaged by the music and fast-paced animation) and even older kids 7+ will learn something. Parents will also chuckle at some of the jokes – watch out for the hilarious Die Hard reference in “Where Does Rain Come From?” – and recognizable guest stars. Educational elements: Science, math, geography, physics and more. Word Party from Jim Henson’s Creature Shop uses puppeteers to perform digitally animated characters in real time resulting in more lifelike animation. Cute diaper-wearing baby animals teach vocabulary through engaging songs and colourful scenes. Educational elements: Vocabulary building and positive emotional messages like friendship and caring. Baby panda doesn’t speak in properly grammatically correct sentence however – some say this is so younger kids can relate to him. Based on the award-winning book series by author and illustrator Anna Dewdney, Llama Llama is an animated show highlighting positive messages about strength of character. The lead parent, unlike most nuclear family setups on TV, depicts a single mother who draws on “the village” of grandparents, friends, teachers, and neighbours to help teach life’s key lessons. Educational elements: Positive qualities like kindness, empathy, and respect. Tumble Leaf follows the visually stunning blue fox, Fig, and his little friend, Stick, as they make exciting discoveries that teach science concepts and solutions to problems to little ones. The format is only 15 minutes long so it’s perfect for little ones with shorter attention spans. Educational elements: Every episode introduces a simple scientific concept in a way that small kids can understand plus there’s problem-solving and creative thinking to inspire pre-schoolers. Super Monsters is an animated series following the adventures of friendly monsters at preschool. Drac, Cleo, Lobo, Katya, Zoe and Frankie are students with dual identities: humans by day and magical monsters (not the scary kind) by night. When one of them gets into a fix, a lesson is learnt so they can correct their behaviours and learn from the experience. Educational elements: Nurturing social relationship through sharing, communicating feelings and respecting others. If mama and dad are Beatles fans, you’re going to have to get the kids on to Beat Bugs! This animated series follows a bunch of best friends, with Beatles songs performed by current artists woven throughout. Educational elements: An introduction to Beatles music, plus positive messages of helping each other. In this fast-paced show acted by kids, Olive and Otto, are the two main agents from the Odd Squad, who are dispatched to investigate odd problems. Their boss, by the way, is another strong female character (high five!). A math concept is embedded in each of their cases, and Olive and Otto must solve the problem-solve to rescue the situation. Educational elements include: Math skills are practised here in a fun engaging way: addition, subtraction, fact families and recognising patterns. Carmen Sandiego is a remake of the popular 1990’s show. Carmen is an infamous’ thief, but more in the Robin Hood vein (returning cultural or historical items to their rightful owners). She’s badass and a strong, empowering female role model (there’s not enough of them around), so this show is great for boys and girls alike. Educational elements: Geographical, historical, scientific and cultural information as well as strategic thinking in Carmen’s mission of good over evil. We liked all the different accents in here, too – from Australian to posh British to American. The Who Was? Show is a comedy series with teen leads that brings history alive by focusing on the subjects of the popular Who Was? books. There’s a lot of humour to get kids interested in the past (expect rapping and some fart jokes), but this show makes an often dry subject very kid-friendly. Educational elements: Historical facts and an introduction to important figures. Horrible Histories is based on a Scholastic book series of the same name. This award-winning British uses slapstick humour to explore history lessons. Each episode intros a different time in history – from Ancient Rome to Tudor England – and to bring the stories to life all the craziest, most bizarre facts (as well as key historical information) are thrown in, making this a highly watchable show for parents and kids alike. Educational elements: Historical events (including some battles). The Blue Planet is a much watched BBC series for the next generation. It’s stunningly shot and provides a wonderful look at the wonders of nature. As it’s a nature programme there are scenes of hunting and animals killing others so although those younger than the recommended age may be keen to view it’s worth bearing this in mind for sensitive kids. Educational elements: Fascinating look at nature, wildlife and broader environmental issues. This 10-episode series sees the co-host of Mythbusters, Adam Savage, mentoring six kids in the fields of engineering, welding, astrophysics and design. Every week Adam and the kids get into teams to test the science behind claims such as “a slinky toy hovers when dropped from a height” and “spider webs are as strong as steel”. Educational elements include: Information on engineering, welding, astrophysics and design plus the show highlights the importance of teamwork and lateral thinking. Based on the internationally best-selling series of books by Lemony Snicket (aka Daniel Handler), A Series of Unfortunate Events recounts the tragic tale of the Baudelaire orphans – Violet, Klaus, and Sunny – whose evil uncle Count Olaf is greedy to get his hands on their inheritance. This is quite a dark show (Season 2 is much darker than Season 1), so we’d advise parents to watch yourself first. Educational elements: Trust your instincts, even as children, along with the value of friendship and kinship. Renowned photographers explore far-flung locales, from a fire rite in the Himalayas to watching brown bears in the rivers of Alaska. The footage is a visual treat and is bound to give watchers itchy feet to see the world. Educational elements: Geographical and cultural insights. The Mars Generation is a Netflix Original documentary that looks at mankind’s future journey to Mars, as told through the eyes of the teens who will be the first ever to set foot on the Red Planet, as well as the leading experts currently pushing the boundaries of technology and innovation in space exploration. The film follows a group of trainees, ages 15-18, at the U.S. Space & Rocket Centre as they prepare to become the engineers, astrophysicists and astronauts of tomorrow. Educational elements: Get an inside look into the architecture of the modern space race. There’s also insight into the historical, philosophical, and technological implications of becoming a multi-planetary species. * How to child-proof your kids Netflix shows: Parents can apply parental controls to the Kids profile, which includes implementing a filter for shows with adult content. There is also a Parental Control PIN to limit access (with adjustable maturity levels) – you can only watch the content once the correct PIN is entered. Or you can download shows to watch offline.